Paretologic’s RegCure Registry Optimizer 1.5.0.0 protects your investment and ensures you maximum PC speed and performance. 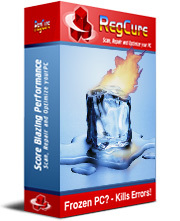 Compatible with all Microsoft products and third party applications, RegCure Registry Cleaner seeks out and repairs those issues in your registry that lead to poor performance such as remnants left behind on your registry from failed installations, incomplete un-installations, disabled drivers, and spyware applications. The scheduling feature tells RegCure exactly when you want it to scan. That means you can sit back and relax while it goes to work. Just set it to scan when your system starts up, or you can program it to conduct sweeps on a daily, weekly or monthly basis. • Quickly fixes corrupted DLLs to reduce PC application errors. • “Scan Progress” screen displays your scans in real-time. • Improves the startup speed of your computer. • Allows you to customize your registry cleans. • Scans COM/ActiveX, Uninstall Entries, Font Entries, Application Paths, Help Files Information, Windows Startup Items and File/Path References.